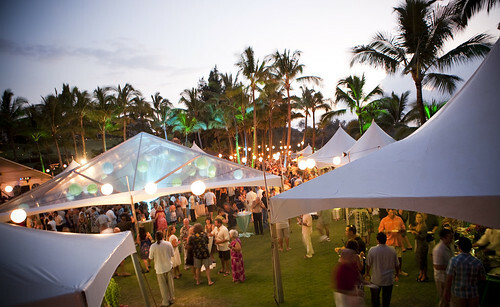 Remember when we posted the some of the upcoming events on Maui for the month of May and June? We did not have the Seabury Hall Craft Fair on the list, but we actually highly recommend it. We just did not have the details when we posted a month ago. Well, we have some information now, we look forward to going there tomorrow! Experience the splendor of springtime in upcountry Maui at the Seabury Hall Craft Fair, a tradition for Maui families for 38 years. It’s always held on the day before Mother’s Day, and provides the perfect opportunity to pick up a unique gift for Mom while the entire family has fun. The juried craft fair features the work of more than 100 local artisans. There’s also live entertainment throughout the day by Gail Swanson, Dr. Nat and Rio Ritmo, Haiku Hillbillies, Marty Dread, and other popular entertainers. The fair includes great food, a bakery with delicious treats, silent and live auctions, games and bouncy rides for the kids, a plant sale and more. 9:00 a.m. to 5:00 p.m. at 480 Olinda Road, just one mile above Makawao Town. Admission is $3 for adults. Children ages 12 and under are free. Free parking is available as well as premium parking for $10. To learn more, visit www.seaburyhall.org. Watch this video from the precious craft fairs to see how fun it is! Fabianis is a little bakery and restaurant in Kihei. It is located in between Kihei Gas and Kihei Storage on East Lipoa Street. Their address is 95 East Lipoa Street for those of you that want to locate them on your GPS and smart phone apps. You can give it a call at (808) 874-0888. It is open for Breakfast, Brunch, Lunch, and Supper. You can pay in cash or any major credit card or debit cards. It is open from 7A till 12 A daily. Fabiani’s is an awesome place to have breakfast, brunch, lunch, and supper. It has good drinks over there also and prices that won’t blow a hole in your wallets or credit cards. This is a place with the local people on their mind. One thing I really like about this place is its affordable prices. On their breakfast menu, the prices do not exceed $8 for what they have on that menu. Drinks are reasonably priced for breakfast. On their lunch menu, the prices do not exceed $11 for what it has on that menu for that time. Drinks are affordable at this time also. The supper menu does not exceed $15 dollars. Fabiani’s have great pizzas. They have awesome choices on the menu to accommodate most people’s needs. For example, they have gluten free pastas and sauces available for people who can’t tolerate gluten. Fabiani’s have great soups, salads, and sandwiches for you too. Oh and who can’t resist desert? They have scrumptious bakery goodness! I had the Chicken Pesto Panini with a side of Salad and for desert their awesome Red Velvet Cake. I have to say, the Panini was so wonderful. It was perfectly cooked and prepared, tasted awesome, and fills you up. The Red Velvet Cake is large enough to feed a couple or a group of three people! It’s that big! The cake was so moist and very velvety when you eat it. It just melts in your mouth that’s how good it is. They have awesome pizza specials and other great specials on certain days too. It’s a very family (ohana) friendly restaurant. Earlier today when I was there for lunch, I saw a mini play group of kids there enjoying some pizza with their parents and friends. The staff are so kind to those groups of people. The atmosphere at Fabiani’s in great! The music they play during the lunch hour is great and it’s not too noisy, just enough so you can hear others and not over power peoples voices. There was a great mix of tourists and locals in there and even had some Maui Police officers, Fire Fighters, and Paramedics in the mix too! Soon they will be having an outside seating for patrons. Fabiani’s has a high quality service. They really take care of you while you are there. The servers and hosts check up on you every 8-10 minutes asking how everything is and give you unlimited refills on soft drinks, coffee, and tea. You won’t be sorry after you’ve tried this place out. If you have any questions about Fabiani’s Bakery and Pizzeria, give them a call and they will help you out! Thank you @JDSmook for your review. A Delightful Review from One of Our Guests! Terrific condo surrounded by beautiful landscape! We were very happy with this condo. We just got back from our 6 day stay and hope to return again next year! The view from this condo is spectacular & breath taking! We enjoyed the sunset every evening & watching out for whales! The photos on the website are accurate. We found the condo to be clean and everything was working. Lots of room for our family of 4; the unit is very comfortable. In the hall closet, we were pleasantly surprised to find a great supply of beach chairs, boogie boards & beach towels available. Saves us from having to buy them & then have to leave behind. The property was very clean, well manicured & beautifully maintained! We were very impressed with all the landscaping that has been done! All the landscaping adds to the privacy around the pool & tennis courts. We snorkeled every morning right in front of our building, enjoyed playing tennis, enjoyed the pool and the beach is very nice. The sand is so soft! We will definately be recommending this property to family & friends. We enjoyed the Luau at Old Lahaina – a great evening out with terrific entertainment! We took the kids zip-lining with Sky-line Eco Adventures who have great, great staff! Such fun! This property & condo are so nice, we felt that we didn’t want to leave to venture out! We were very happy to stay put & relax! 1. Maui Onion Festival at the Whalers Village in Kaanapali – Saturday, May 5 There are onions. And then there are Maui Onions. Believed by many to be the sweetest onions in the whole wide world, these glorious bulbs are the star of our annual festival. 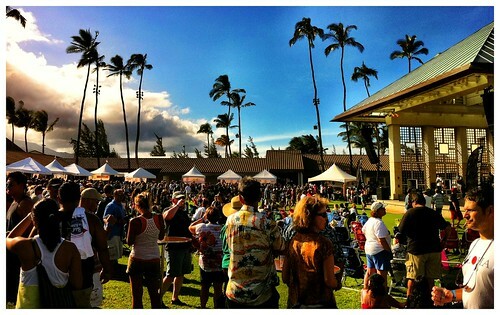 The Maui Onion Festival has been a signature event at Whalers Village since 1990. It’s dedicated to the cultivation and promotion of the world-famous Maui Onion and is attended by thousands of visitors and residents every year. 2. Maui Matsuri, Saturday, May 12th, 2:00 pm to 9:00 pm University of Hawaii – Maui College The 12th Annual Maui Matsuri scheduled for May 11-12, honors Japanese cultural traditions with its annual theme of “Kodomo No Tame Ni (for the sake of the children).” Young and old alike will delight in this year’s offerings of art, entertainment, contests, crafts and food. A free Family Movie Night will be held on Friday, May 11, in the University of Hawaii – Maui College Student Center (Pilina Building). The Matsuri festivities continue on Saturday, May 12, from 2 to 9 p.m. at University of Hawaii – Maui College, where Matsuri organizers will transform the grassy knolls of the campus into a bunkamura (Japanese village), dotted with stalls selling mouth watering goodies and a variety of crafts. The demonstration and entertainment stages will showcase the best of Maui County’s Japanese and Okinawan talent as well as traditional martial arts and eating contests. Contestants are also being sought for the saimin and natto eating contests, and the costume cosplay (costume play) contest. Keiki have a world of their own at the Kodomo Korner where tons of hands-on free craft activities such as origami and gyotaku (Japanese fish printing) will be available. 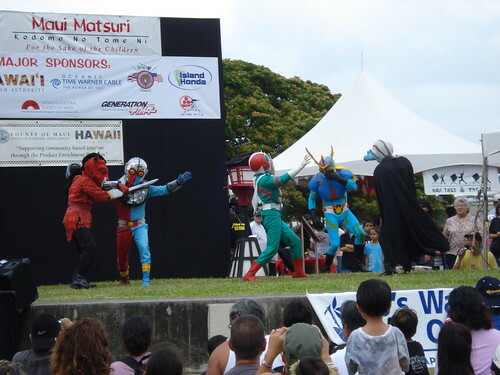 Japanese superheroes Kikaida and his friends headline the event at 3:30 p.m. and 5:30 p.m. The festival ends with a community obon dance starting from 7:30 pm. The community is invited to wear a hapi coat or kimono and join in on the dancing. Admission to the festival and parking are free. 4. Ka‘anapali Beach Resort will welcome 60 of the best watermen and women who practice ancient Hawaiian canoe sailing at the 7th annual Wa‘a Kiakahi Festival, June 1-3. Events will include traditional Hawaiian welcome and farewell ceremonies, sailing canoe rides, celestial navigation and history talks, and race viewing. Created by the Hawaiian Sailing Canoe Association (HSCA), Wa‘a Kiakahi is anevent dedicated to traditional Hawaiian canoe sailing and the education of its history. Contrary to ordinary outrigger canoe paddling, HSCA honors how the ancient Hawaiians actually traveled between the islands: members do not make crew changes during races and they travel every island channel that connects the Hawaiian islands. The mission of the Hawaiian Sailing Canoe Association (HSCA) is to learn, revive,educate and practice the ancient Hawaiian skills and values as they relate to sailingcanoes and the Hawaiian culture. HSCA is the only Hawaiian sailing canoe association in the world and is celebrating its 25th anniversary in 2012. For more information, visit the Kaanapali Resort Blog. 5. Kapalua Wine & Food Festival on June 8–10, 2012 A collaboration of Kapalua Resort partners creating a new spin on the longest running food and wine event in the USA and showcasing why we are “Lucky Live Hawaii!” This celebration of the finest in food and wine will embrace all things Hawaiian, especially the fabulous culinary bounty on Maui and here at the world renowned Kapalua Resort. Hawaiian Culture meets the Big Screen at this annual film festival in Wailea. Film Premieres at the Celestial Cinema are set up in Wailea Golf Club’s driving range; Maui Skydome is in the Wailea Resort; Castle and McCoy Theatres are at Maui Arts & Cultural Center. Special events include the celebrity Tributes, Starry Night Moon Dance; Taste of Chocolate; Taste of Wailea, plus filmaker panels and industry awards. Hoolaulea Opens at 9:00AM Pau Parade Begins at 9:45AM. This event is to honor the Kamehameha Lineage with a day of celebration and commemoration in the center of the first capital of Hawaii. Pau Parade will commence at 9:45am from Kenui St. down Front St. to Shaw St., Hookupu Ceremony, Games, Entertainment, Food, Crafters, Exhibits and Tours. The Pau Parade will commence at 9:45 am from Kenui St. down Front St. to Shaw St. Six Commentary Stations along Front St, Longhi’s, Kimo’s, Cheeseburger in Paradise, Lahaina Pizza Co., Wharf Cinema Center, and Kamehameha Iki Park! Contact Daryl Fujiwara at 808-264-8779 or e-mail him at sfdhawaii@gmail.com for more information.